There were a couple shows that we just couldn’t get to (but really wanted to) during Fringe this year. 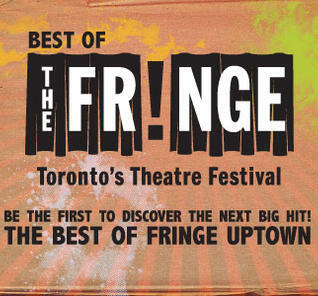 Luckily, there’s The Best of Fringe Uptown where the best of the best productions are remounted for a handful of performances each. This year the selections included some of our favourites from our week at the Fringe (Mickey and Judy, Living with Henry, Pitch Blond and Love,Virtually) but also afforded us the opportunity to see three of the shows we tragically missed. Here’s the skinny on those shows which proved the very definition of “Best of”. I’m currently at that terrifying juncture of my life when my I’m just old enough for my childhood to be evoked for nostalgic satire. It’s hilarious, I get all the jokes, but it’s also just the tiniest bit sad. 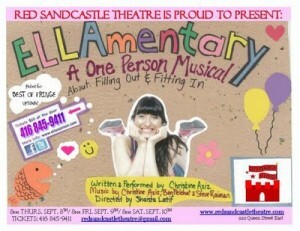 Christine Aziz’s hilarious, heartwarming and poignant one-woman show ELLAmentary filled me with such yearning nostalgia for my 90s pre-adolescent years that I began to rewrite history in my head: it was a wonderful time full of fun teenybopper magazines and cheesy soft rock, not isolating or uncomfortable at all! In truth, Aziz’s story of Ella Salmon (get it? It sounds like salmonella!!!) isn’t at all about how great those awkward middle years are, it’s about how rewarding they can be if you just be yourself. Those years between the ages of 10 and 15 are most people’s biggest conformity years; at a time in your life when every sign points to “just try to fit in!”, Ella Salmon teaches us that it’s so much better to stand out. She’s smart and funny and at her very best when not playing by society’s arbitrary rules. The piece is perfectly constructed as a song-and-dance-filled tromp over the all-too familiar territory of your first school dance, your first training bra, your first magazine subscription! My God Aziz is a brilliant performer (she has the voice to tackle a Broadway lead, the comic timing for the TV show of her choice and the emotive sympathy of a great stage actress) and her sympathetic heroine is the most engaging I saw at the Fringe this year. There’s no way that Aziz and I walked all that similar of pre-teen trails, but as she lamented learning from a Fully Alive textbook, evoked the name of it-girl Kelly Kapowsky and perused the pages of YM magazine as though it were Shakespeare, I was right there with her- getting ready for a school dance, giggling about boys and convincing myself that “this is my year”. It took me 30 seconds to realize that Remember, Maggy? was going to be amazing. When Denise Oucharek entered in a small stage right spotlight to tell childhood stories about her sister Maggy, I was immediately drawn in by the outstanding actress. Smart and sympathetic, Oucharek’s Kate was fully fleshed out from the moment she spoke, evoking not only her own character but a sense of her sister and mother as well- drawing on a flawless Irish lilt to impersonate her immigrant mother. 2010 My Theatre Award nominee Rosemary Doyle was also stunning as the potentially tiresome Maggy. The wildly different actresses created such an intimate chemistry that they absolutely nailed the most difficult of stage relationships- siblings. They were opposites who hated and loved each other in equal measure, inextricably linked by history and kinship. No matter how infuriatingly self-centered Maggy was or how frustratingly stilted Kate proved, neither ever wavered away from the potential for sympathy. The central sisters represented the mutually exclusive, equally inadequate options for the grown children of single parents with alzheimers. Do you stay and give up your life to care for the one who cared for you or do you leave them and try and make the most of the life they gave you? Neither is fair, neither is fully right and both leave you resentful of those who chose the opposite direction from you. Joan Gregson gave a nuanced performance as the steadily declining mother Niamh and Alanis Peart rounded out the cast with a wonderful performance as Kate’s enthusiastic neighbour Irene. At first her character annoyed me, as she does Maggy, coming off as campy and unrealistic (especially in contrast to the subtle creations around her). But as the story continued and Irene’s unwavering loyalty, modest selflessness and unending patience shined through I began to see what Kate saw in the exuberant character and began to appreciate Peart for daring to risk alienating the audience in order to let us get to know her gradually instead of love her immediately. The heartbreaking script from mother/son team Carol Anne and Matt Murray was full or surprises from its humour to its dramatic twists to its cleverly foreshadowed reversal at the end. The perfect title has about 5 possible meanings within the context of the complexly human story. Is it Kate asking their mother if she remembers her eldest daughter? Irene asking Kate the same question? Someone asking if it really is Maggy returned? Kate asking Maggy if she remembers a particular memory? A plea that the family always be able to remember Maggy? The many questions that those two words could be reflects exactly what it is that makes Remember, Maggy? so wonderful. It’s perfectly acted (Oucharek, in particular, was the most memorable actress at the Fringe), a superb script and well-staged, but it’s the intensely real ambiguity of the story that really makes it different. It’s small, it’s simple but within it lies more questions about right and wrong, reality and fantasy, friendship, family, memory and life than could possibly be examined in a seemingly larger piece. Kim’s Convenience was the big hit of this year’s Fringe Festival. It really struck a chord with Toronto . Living in the most multicultural city on earth, Toronto audiences saw in the Kim family the story of how our city was built: one generation at a time. Half the people I know in this city are first or second generation immigrants- from Korea (like the Kims), from Lebanon, from Nigeria, from Portugal, from Ireland- from anywhere and everywhere. In Kim’s Convenience lies a story that is both intensely personal, wonderfully universal and uniquely Torontonian. Ins Choi’s script (winner of the 2011 Fringe New Play Contest) is as fine-tuned and sharp as they get- heartbreaking, clever, fast-paced and funny in a really human way- and the cast is brilliantly up to the task. Oftentimes at the Fringe you find productions that are sort of half-baked, actors without the technique to be very effective, scripts with potential that need at least one good re-write. But Kim’s Convenience doesn’t at all feel like a Fringe play; it’s as polished and complete as productions that cost literally ten times as much for a ticket. Paul Sun-Hyung Lee owns the show as the titular Mr. Kim, owner of a convenience store in Regent Park. His bilingual performance is stunning, from his accurate but always decipherable accent to detailed mannerisms to insane comic timing, convincing temper and heartbreaking sadness, Lee is just genius in the role he seems to have been born to play. Familiar to audiences for his countless stage and screen credits (Train 48! ), Lee disappears into Mr. Kim, creating a palpably real creature who’s both unique and ever so familiar. The rest of the cast is excellent as well. Esther Jun’s take on Mr. Kim’s 30-year-old highly assimilated daughter is wonderfully nuanced and playwright Ins Choi creates a fascinating character of the prodigal son. The regretful, dissatisfied, conflicted character is the counterpoint to his father- both the person who tortures him most and his only hope for fulfilling his dreams. Jean Yoon rounds out the Kim family as its demure matriarch. With a few exceptions, Yoon plays most of her scenes in Korean but is so emotive that I didn’t struggle for a moment to understand. (It’s also worth noting that when I didn’t laugh at a particular exclamation from Mr. Kim, the nice man sitting next to me leaned over and explained that “he just said ‘I’m going to take a big poop in Korean’- the kindness of strangers!) The final castmember is Andre Sills, who plays every single other character in the play- a smorgasbord of race and socio-economic situation. The fact that he’s able to differentiate each character so clearly is a massive testament to his technique. The staging is simple and rightly so, the set an uncomplicated suggestion of larger surroundings. Kim’s Convenience distills the theatre experience down to the things that really matter- strong material in the hands of talented people. The side-splittingly funny production tells a great story on both its personal and global scales; it enlightens, provokes, teaches, reminds and affects its audience, inspiring tears in most of the eyes I saw leaving the theatre. That, ladies and gentlemen, is how it is done. And with that, our 2011 Fringe coverage finally comes to a close. Stay tuned for all the info from our week at the Summerworks Festival as well as full seasons of Stratford, Shaw, Soulpepper and more. Thanks to everyone who made this Fringe particularly wonderful and be sure to look for our special Fringe categories in this year’s My Theatre Awards.